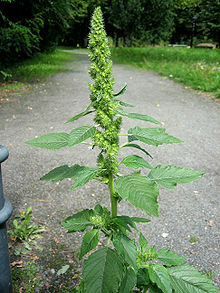 Amaranthaceae is a faimily o flouerin plants kent as the amaranth faimily. It nou includes the umwhile guissfit faimily Chenopodiaceae, an conteens aboot 165 genera an 2,040 species. makin it the maist species-rich lineage within the flouerin plant order o Caryophyllales. This page wis last eeditit on 20 Mairch 2017, at 03:14.